It’s been seven days since I wrote my open letter to Malcolm Turnbull and Kelly O’Dwyer without the courtesy of a response or acknowledgment. Did I expect anything? Quite frankly, no. What I didn’t expect was the overwhelming response by so many of you to my letter which was shared with hundreds of people. 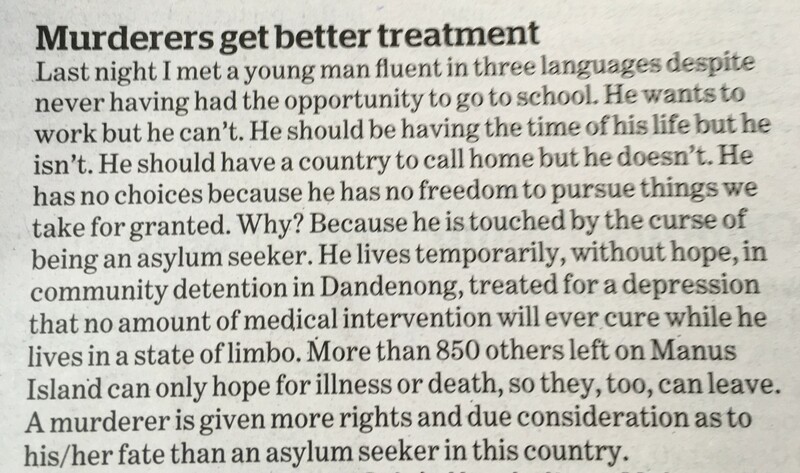 I didn’t expect an extract to be published in ‘The Age’ newspaper either. Thanks everyone for your support – it means a lot. Meanwhile the young man I met last week still languishes with no end to his detention in sight, along with all the others on Manus Island. In the meantime, why don’t you write a letter to your Member of Parliament? Just ask the same question too. This entry was posted in Writing and tagged asylum seekers, Manus Island, politicans, refugees on September 29, 2016 by S.C. Karakaltsas.